MARCO REGINELLI, the son of Saverio Reginelli, was born in Neppazzano, Teramo, Italy on January 2, 1897. 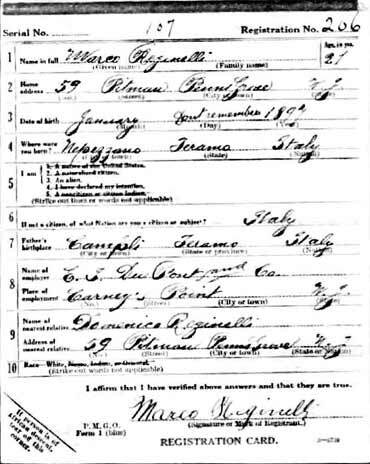 He sailed from Naples, Italy on May 14, 1914 aboard the steamship Taormina, arriving in Philadelphia on June 14. Immigration records state that he entered the United States on June 24, 1914. His brother Nazareno was already in the United States, living at 800 South 10th Street in Philadelphia. 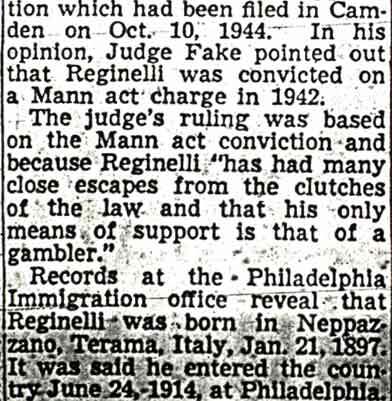 By June of 1917 Marco Reginelli was living at 59 Pitman in Penns Grove NJ. He was then working as a laborer at the E.I. DuPont chemical factory in nearby Carney's Point. 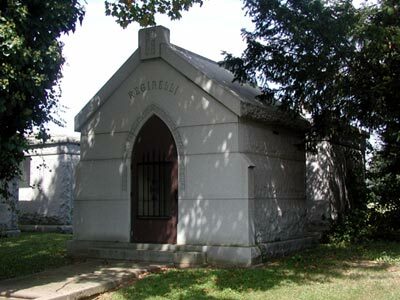 He resided with Domenico Reginelli, who most likely was a brother. 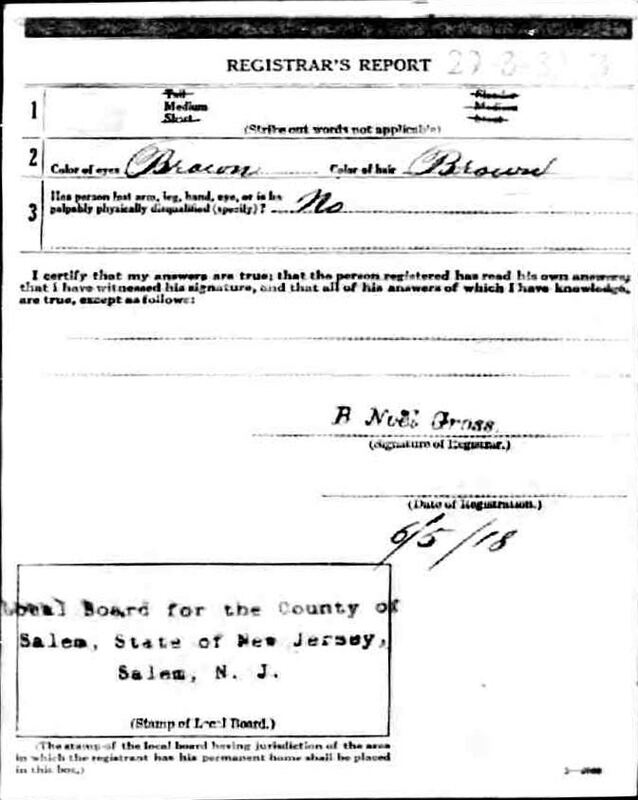 Domenico was still living in Penns Grove in 1920, but Marco had apparently moved to Philadelphia, Pennsylvania. 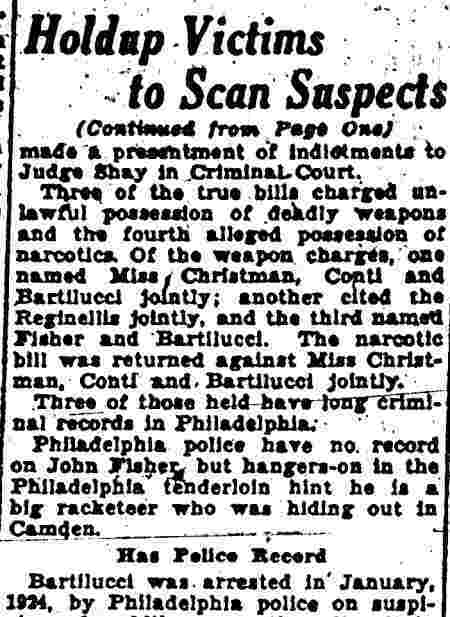 On January 1, 1925 Marco Reginelli was arrested in Philadelphia as a "suspicious character". 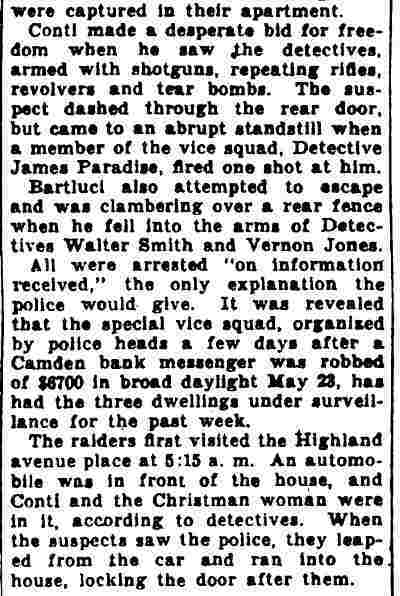 He was arrested twice in 1924 on charges of larceny by trickery, but both charges were dismissed. 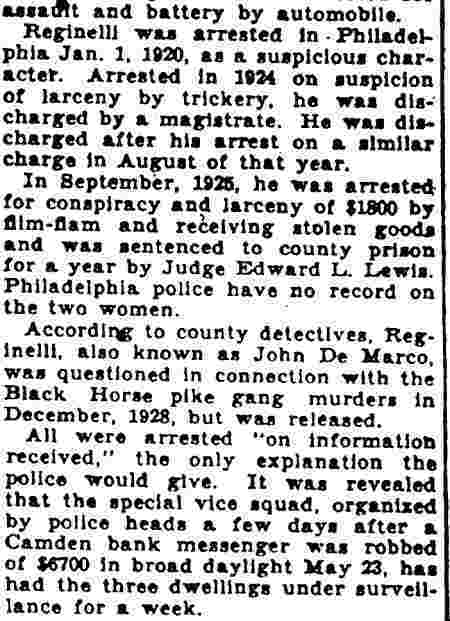 In September of 1925 he was sentenced to one year in the Philadelphia County Prison on conspiracy, larceny and stolen goods charges. After his release from prison, Marco Reginelli came over the bridge to South Jersey. 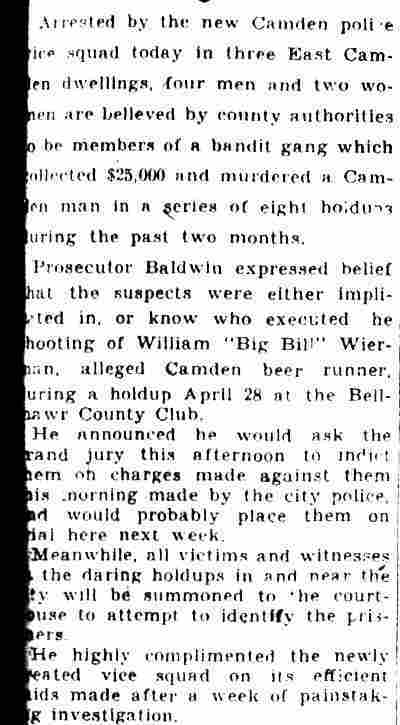 He was questioned in December of 1928 in relation to gangland murders in South Jersey. 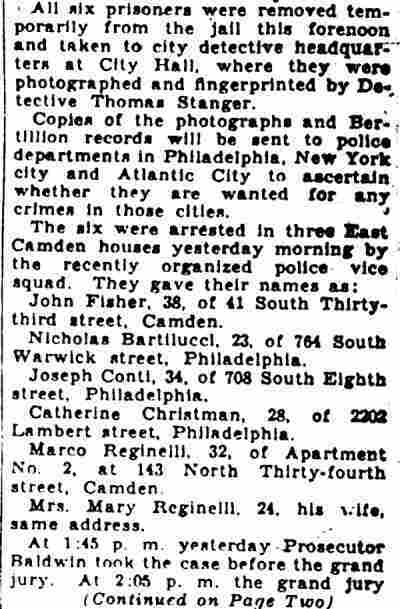 By the spring of 1930 Marco Reginelli was living in East Camden, in an apartment at 143 North 34th Street. 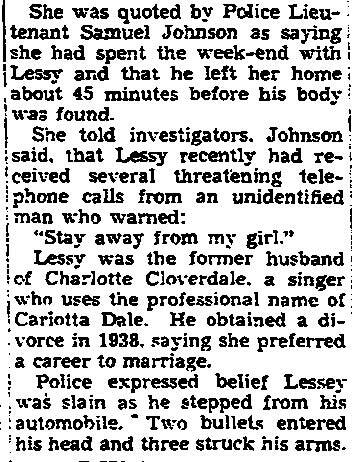 Newspaper reports of the time state that he was married. He was one of six individuals arrested on weapons and other charges, which apparently, at least in Reginelli's case, not proven. 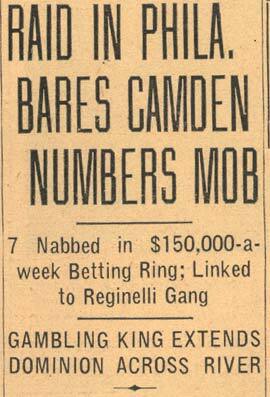 By June of 1939 Marco Reginelli had already established himself as a power in Camden and South Jersey organized crime circles. The 1940 Polk's City Directory shows him living at the Plaza Hotel at 500 Cooper Street. 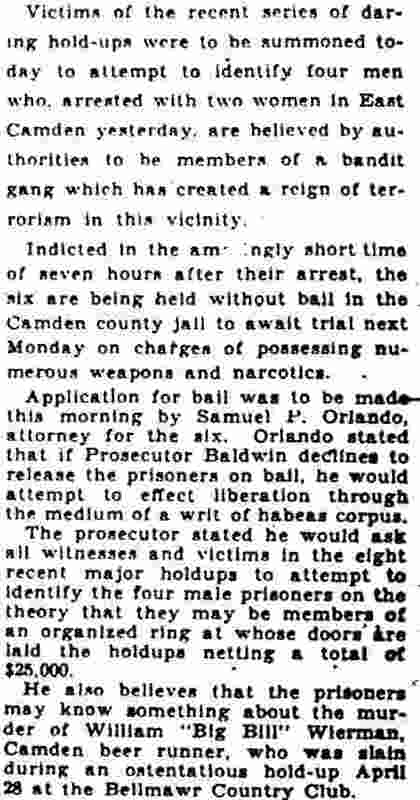 He had purchased a home at 2403 Baird Boulevard by April of 1942.
more brushes with the law, but his only conviction through the spring of 1950 was a Mann Act violation in 1942. 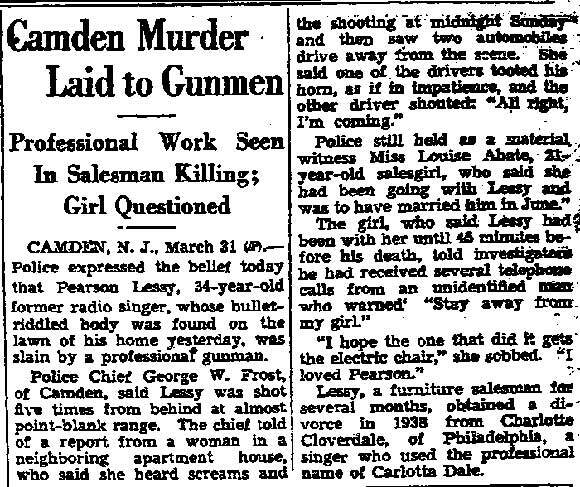 From the mid-1940s, he had ties to 2403 Baird Boulevard in East Camden. He was known to frequent Sciamanna's Cafe also known as Sherman's Cafe, at South 4th and Royden Streets. 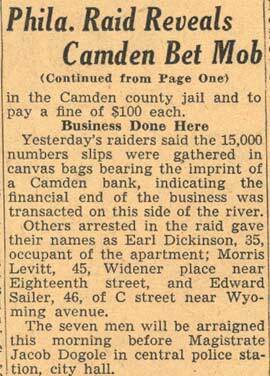 He also is known to have lived at 426 Line Street in Camden. 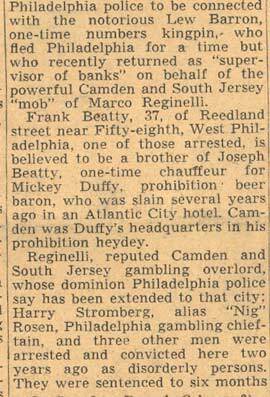 In the years after World War II up until his death in 1956, Marco Reginelli, whose specialty was gambling, all but ran the Philadelphia family from his base in Camden, New Jersey upon his promotion to under-boss. 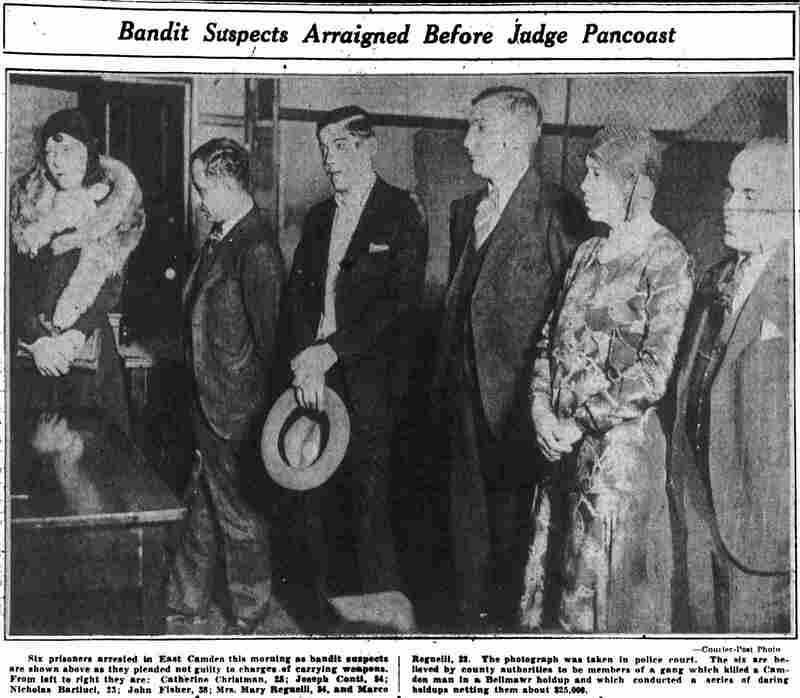 While in control of the Philly family, Reginelli promoted many of his gambling associates to mid-level management positions including Angelo Bruno, a numbers specialist. In spite of his small stature, Reginelli, who was known as "The Small Man", inspired fear and respect within the Philadelphia family. 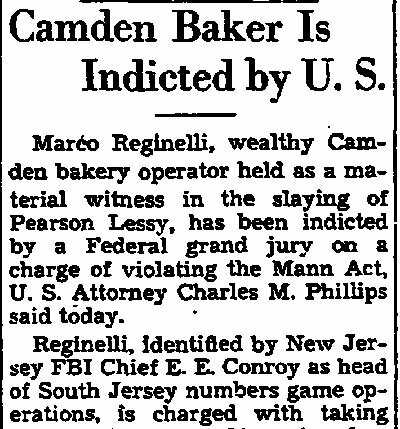 From his base in Camden, he expanded the Mafia operations through South Jersey to Atlantic City. During this period he built the famous 500 Club in Atlantic City, which is where Dean Martin and Jerry Lewis first teamed up. 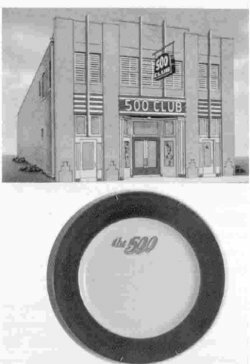 Reginelli owned the 500 Club which also was a frequent host to Frank Sinatra during the 40s. The Federal government tried to rid themselves of Reginelli through deportation. 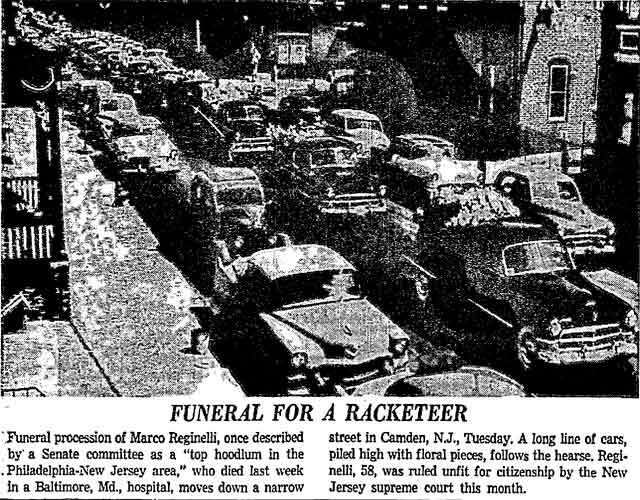 Their efforts proved unsuccessful, as the well-connected Reginelli had a lawyer, Murray Chotiner, with friends in very high places. He was naturalized as an American citizen in the mid-1950s, but was stripped of his citizenship shortly before his death. 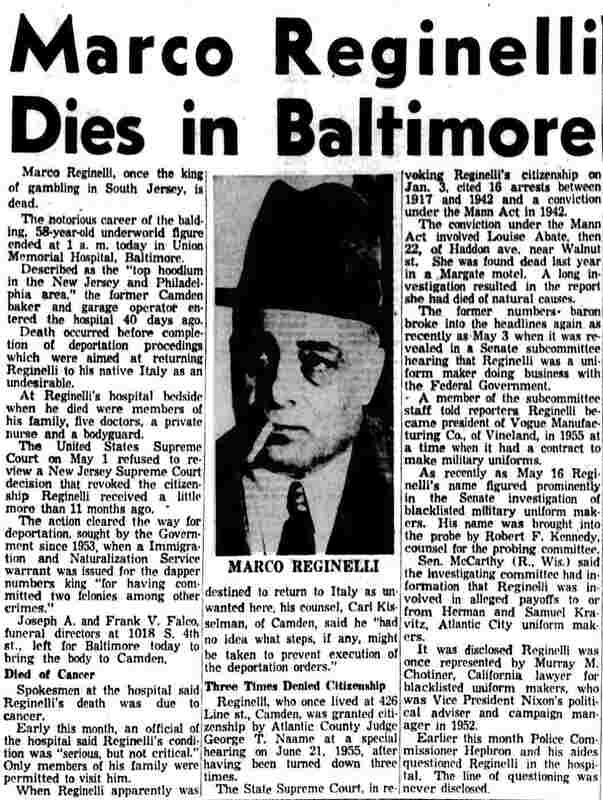 Highly respected in Mafia circles, Marco Reginelli died from natural causes on May 26th of 1956, at Baltimore MD. 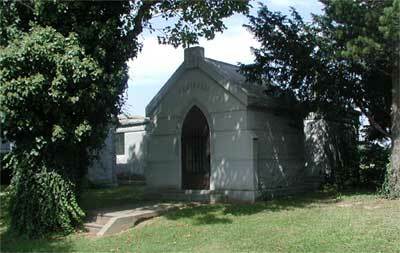 He was interred at Calvary Cemetery in what was then Delaware Township (present-day Cherry Hill) NJ. 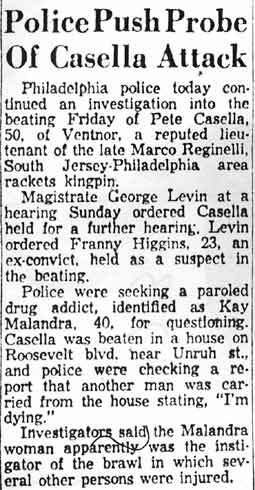 Dominick "Big Dom" Olivetto is alleged to have stepped into Reginelli's shoes after his death, maintaining the rackets that he had built, under the aegis of Philadelphia boss Joe Ida. 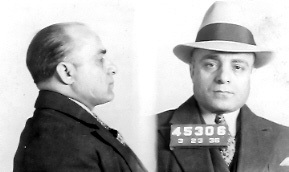 Olivetto was one of the many Mafiosi arrested at the Appalachin conference in upstate New York in November of 1957, and in fact had come to the meeting in conference with Vito Genovese. 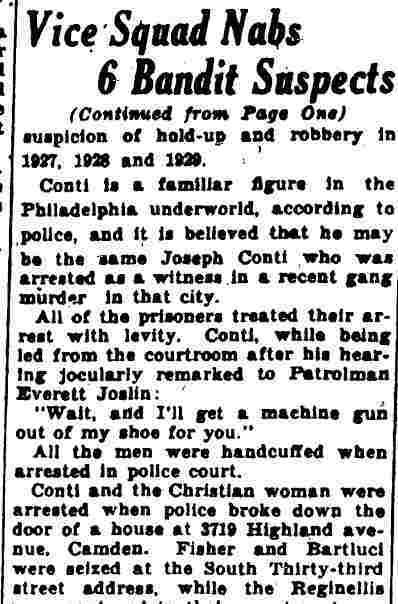 After Appalachin Olivetto appears to have stepped aside, and in time Angelo Bruno would take control of the Philadelphia and South Jersey mob. Maple Shade's so-called "plumbing warehouse" proved to be just what residents suspected it to be- an elaborate gambling establishment. New Jersey state troopers from North Jersey smashed their way into the thriving gambling house early Thursday morning at Fellowship road and State Highway Route S-41, arrested 187 men, and confiscated more then $40,000 in cash. 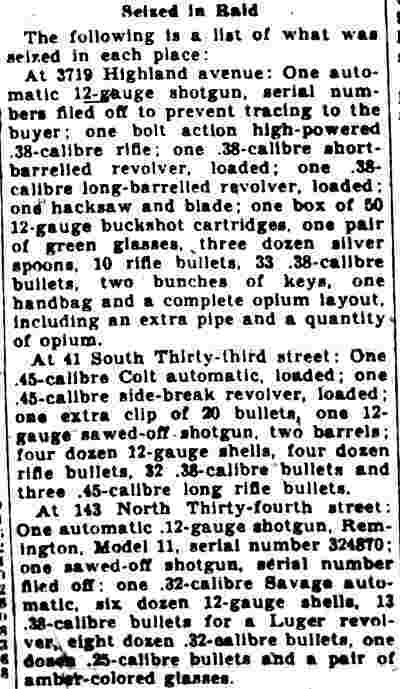 Two revolvers and a clip of ten loaded cartridges for a carbine were seized in the surprise swoop. About twenty of those arrested were taken into custody when they arrived at the jam packed establishment unaware that the police had moved in. 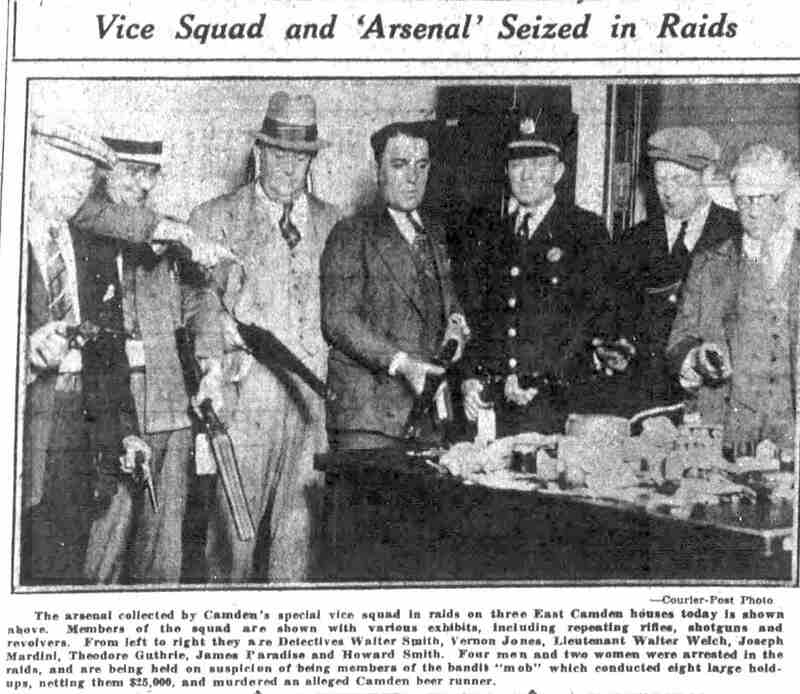 Thirty men were questioned as suspected operators, lookouts, card dealers and dice "stick men," and 19 of them were eventually held as "principals." All the others were given a prompt hearing before a judge in Maple Shade, and were released after depositing $25 cash bail. Most of them said they were from Camden or Philadelphia. 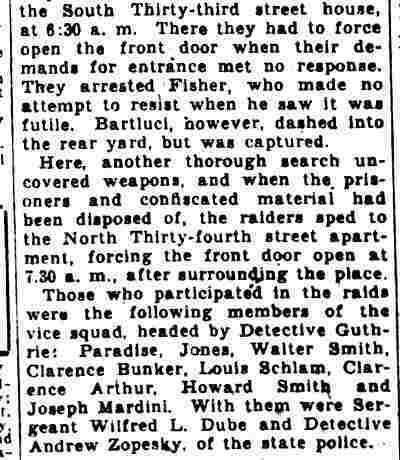 The raid, described by its leaders as one of the biggest ever staged in South Jersey was executed at 12:50 a.m. by eight uniformed troopers and nine plain clothesmen acting under special orders from Colonel Charles H. Schaeffel, head of the state police. Eight additional uniformed men were called in later from barracks at Columbus, Berlin, and Riverton. Maple Shade Police and township officials were not notified of the raid until after it had taken place. It was one of the biggest gambling raids ever staged in New Jersey. The target was a one-story cinder brick structure, resembling a garage or warehouse, nestled in a clearing surrounded by thick woods not far from intersections of Route S-41 and Fellowship road. A narrow country lane, located about 150 feet off Fellowship road, served as the entrance. 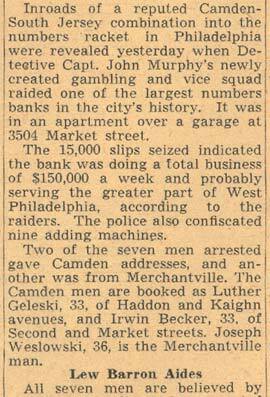 Police said that many patrons had been taken to the gambling house by "luggers" operating limousine service from Philadelphia, and from other places within a radius of about 60 miles. The ground for the building was sold to Domenic Iacovelli at public sale by the Maple Shade Township Committee on April 26 with Thomas Vogdes, Main Street real estate agent, acting as agent for Iacovelli. On July 12, Iacovelli bought another piece of land adjoining the first parcel from the township. An investigation today revealed that the township has no record of Iacovelli's address although it is believed he resides in Camden. It is reported that the building was erected in 17 days with workmen working 24 hours a day. Some local men worked on the erection of the building. 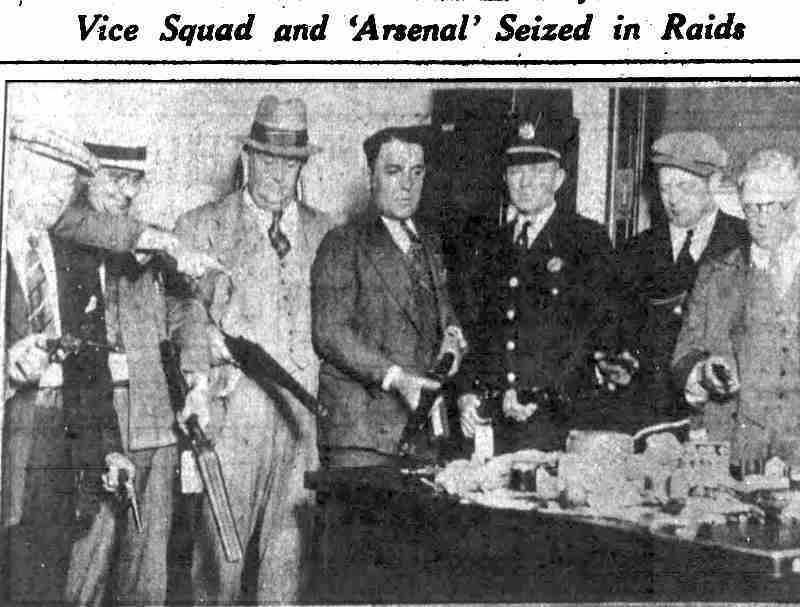 The raiding party was led by Captain Arthur Keaton and Emerson Tschupp, deputy director of the New Jersey Alchoholic Beverage Control Commission. The magnitude of the raid was such that it was more then eight hours after the troopers struck the gambling joint at 1 a.m. until the last of those seized had been booked at the Maple Shade police station. 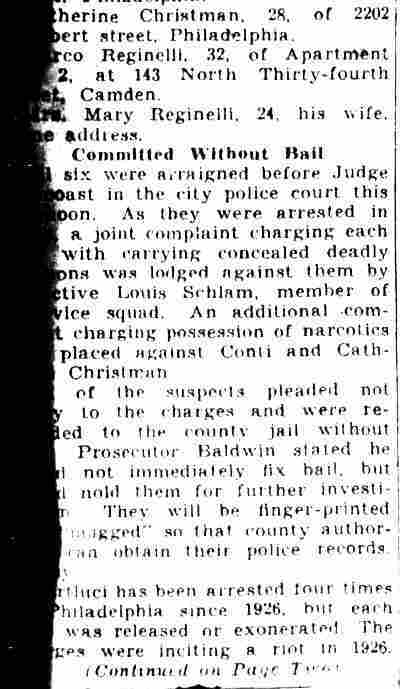 Fourteen of those arrested were held in $5,000 bail each as principals by Municipal Judge Bowers of Cinnaminson township; four were held in bail of $1,000 each as material witnesses and one held in $2,000 bail as a material witness. 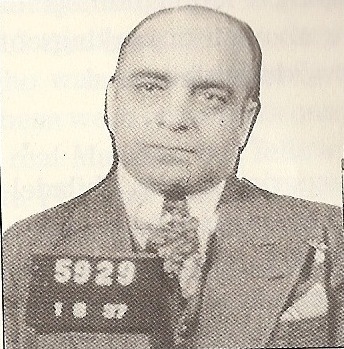 Nicholas Bocchicchio, of Clifton avenue, Westmont, identified by Keaton as a brother of Felix Bocchicchio, who is manager of heavyweight Jersey Joe Walcott. Levi Cicero, 715 Second street, Florence. Pasquale Beato, 2820 North Twenty-third street, Philadelphia. 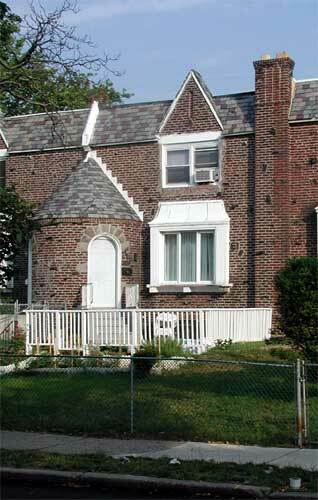 Thomas Girgenti, 1208 Haddon avenue, Camden. Henry Duncan, 600 Holmes street, Burlington. Gardon C. Gober, Cedar lane, Florence. Christie Scittina, 1207 Callahan street, Yeadon, Pa.
Dominick Di Mattia, 16 South Forklanding road, Maple Shade. Joseph Putek, Fulton street, Delaware township. 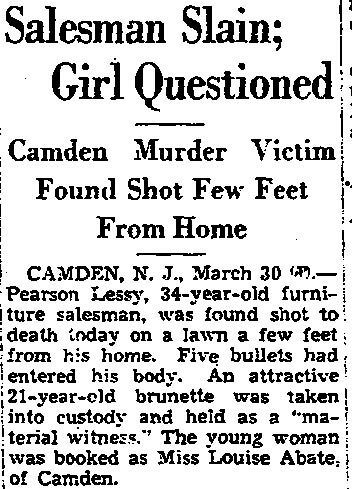 Anthony Meloni, 5302 Sherwood Terrace, Pennsauken. Manuel Gattabrio, 312 South Twenty-seventh street, Camden. 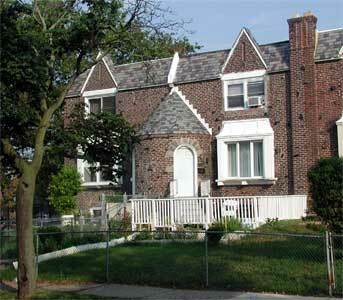 Harry Donaphy, 3901 Lawndale avenue, Philadelphia. Frank Pollastrelli, 723 Monmouth street, Trenton. 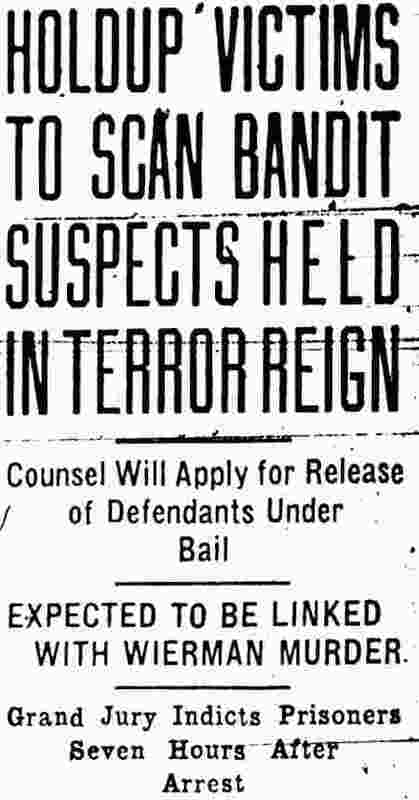 Bail was posted for Girgenti by N. Morton Rigg, a Burlington attorney. Complaints against the suspects were signed by State Police Lt. Clinton J. Campbell, Columbus barracks. The other 166 seized were booked as disorderly persons and were released in $25 cash bail each for a hearing August 17. Captain Keaton, who led state troopers last Tuesday in raiding the national headquarters of a $50,000,000 lottery ring in New York, said he recognized henchmen of Marco Reginelli among men seized. After undergoing questioning in the gambling establishment for more then three hours, the patrons were transported in one of Fred Olt's buses to the Maple Shade police station. The station became so crowded it was necessary to use the auditorium of the municipal building to book the men. 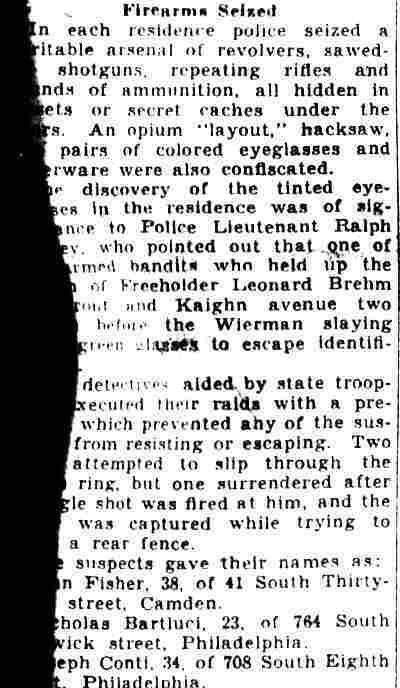 The raiding party, in addition to Captain Keaton and Tschupp, included eight uninformed troopers in charge of Lt. Albert G. Varrelman, and nine in plain clothes. They reached the place at exactly 1 a.m.
Lookouts stationed in a cupola-like arrangement in front of the building, immediately detected them and alarm buzzers were heard sounding inside the 100-foot long building. Previous inspection of the exterior of the building, it was learned from the troopers, indicated there were only two exits, the four-foot wide door in front and another the same size at the rear. As they pulled into the ground one trooper drove his car to the rear and blocked the door. Others, carrying 20-pound sledge hammers, attacked the front door, later found to be lined with armor plate, but could not batter it down. Spotlights on the troopers' cars were turned on the front of the building and revealed a window, about six by 12 inches, to one side. Working from the top of one of the cars, the troopers smashed away at this until a hole was made large enough for one of them to crawl through. Sgt. 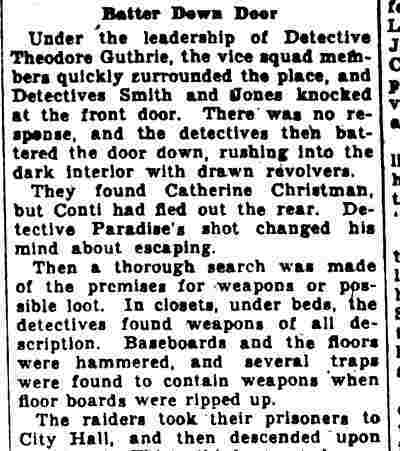 Thomas Degaetano was then lifted through the opening and as he dropped to the floor inside, he drew his revolver and ordered everybody inside to the rear end of the room. Degaetano was followed by Sgt. 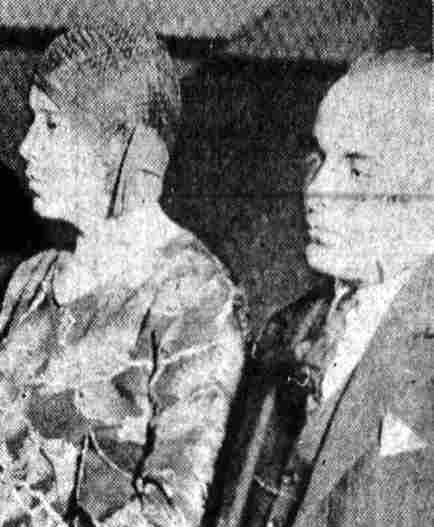 Hugo Stockburger, who, on getting inside, unlocked a door leading to the entrance hallway and then removed the steel bars barricading the front entrance and admitted the main body of raiders. As he led his men in Capt. Keaton found the place a shambles from efforts of the operators to destroy all gambling evidence possible. Four slot machines that had occupied a table to one side of the main room, had been carried into an office whose door also was lined with bullet-proof armor. Three expensive dice tables, each large enough to accommodate 35 to 40 players, and a black-jack table, almost as large, were found with their felt lining partly ripped off. None of the men in the room offered any resistance, largely Keaton said he believed, because he and the rest of the troopers came in "with guns swinging." Keaton then divided the patrons and the staff operating the place into two groups and ordered themto opposite sides at the rear of the building. He and other officers among the troopers began questioning the men while waiting for a squad of eight more troopers from the headquarters identification bureau at Trenton. When these troopers arrived they took over the formal questioning. They directed each man to give his name and occupation and show identification cards. Then they fingerprinted everyone in the building. 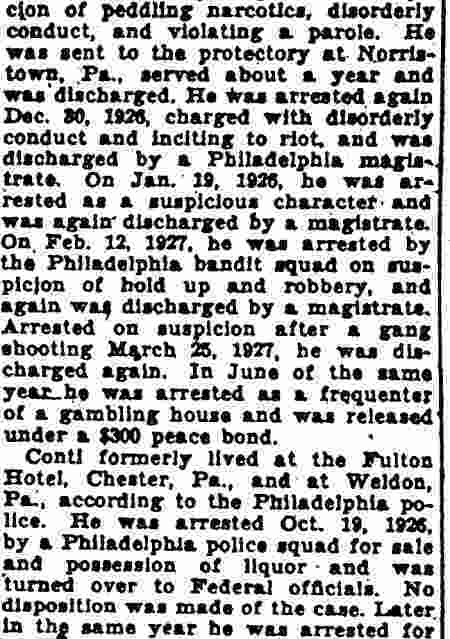 Any of the patrons who had less then $400 cash or who was not recognized as a police character was listed as an inmate of a gambling establishment. Most of the money confiscated was found on those listed as principals. One of these had a $13,000 bankroll. Two more had $12,000 each; another had $10,000, and a fifth man had $8,000. Across one side of the room was a large sign that read: "Open every day and night including Sunday." The payoff on daily doubles, still another sign read, was 5 to 1. The setup also included counters made of plywood, some where bets were accepted and others used in paying off winners. These counters were large enough, Keaton said, to accommodate from 20 to 30 players at a time. The only windows in the building were about 18 inches by 10 inches, and were located almost at the top of the walls, about 12 feet high. Ventilation was furnished by two huge electric fans which played on a continuous flow of water in a trough-like arrangement of tin and the air was forced into the room through two six foot tunnels made of plywood. ........as Marco, I had a relative who as a young barber cut Marco's hair. Everyday he went to the same barber shop to get a shave or light trim. The usual barber was not around and this fellow had to give a trim as Marco was in a hurry. He told me that a guy stood behind him the whole time he had Marco in the chair. Said he was so nervous he almost slipped. Woody told a story of Marco Reginelli who took numbers and hung at the bar. My old man was quite a drinker at 9 while tapping my Grandpop's wine barrels with his uncle Leo Doria and was hanging around the bar when a ragged black man came into the bar asking for food. As the story went Marco said "so you're really hungry huh?" The man replied "yes". The locals at the bar knew that the guy would be in serious trouble if he wasn't. Marco said "give him a bowl of tripe" which Mr. Sherman served up and Marco offered him a glass of wine which he gratefully took. When he finished Marco asked "are you still hungry" and the man said "yes, I am" and Mr. Sherman gave him another large bowl of tripe with bread and he ate it all. When he was done Marco said "you have a lotta guts walking in here for a handout" and reached into his pocket and handed the man $50. and told him "I don't ever want to see you in here again". I never read anything about Marco until tonight and my Pop's story was told to me on several occasions. 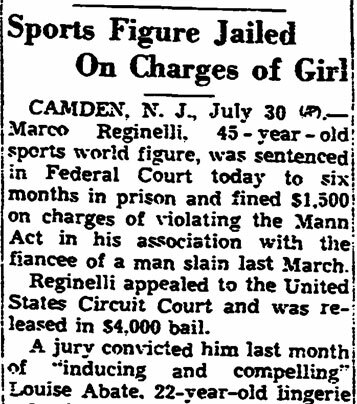 Later in life my Pop mentioned that Marco was a major racketeer but obviously had a kind streak. Wiretap evidence against Philadelphia mobs is being examined by immigration agents in an effort to strip Marco Reginelli, South Jersey gambling czar, of his citizenship. 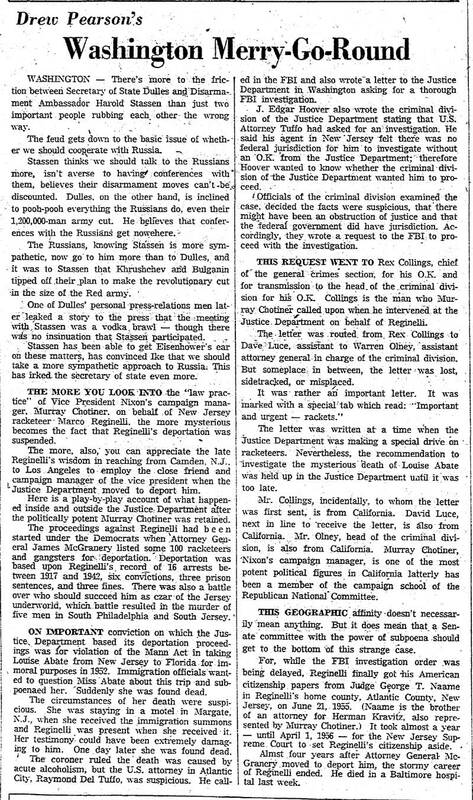 The investigation was revealed when Samuel Horowitz, of the Bureau of Immigration and Naturalization legal staff, conferred with District Attorney Samuel Dash and police officials in Philadelphia. Immigration officials expect hundreds of reels of tape-recorded telephone conversations obtained by Philadelphia police will provide evidence linking Reginelli to racket mobs in Philadelphia, it was learned. Such evidence would be used in the Government's fight against the citizenship granted to Reginelli on June 21 by the Atlantic County Court. 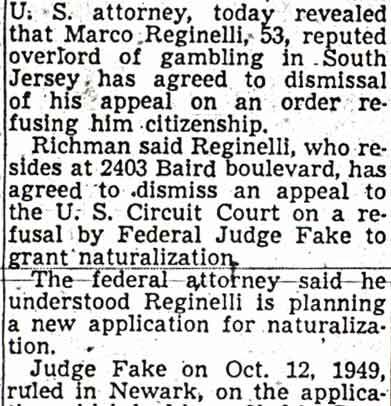 Reginelli was granted citizenship in Atlantic County, which has no Federal court, after three Federal courts elsewhere had refused him citizenship. The citizenship conferred by the county court was subject to a Federal examiner's approval. 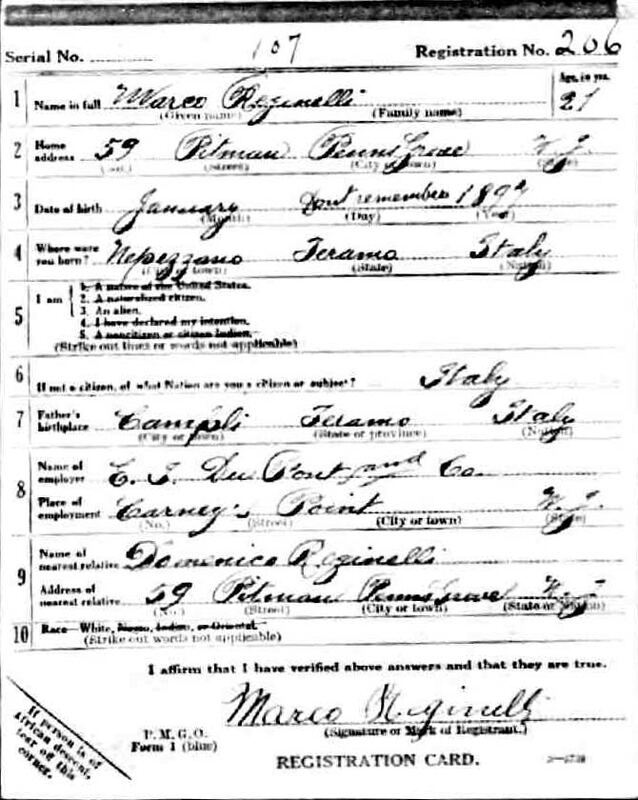 Before Reginelli was sworn as a citizen he faced deportation to his native Italy as an undesirable. 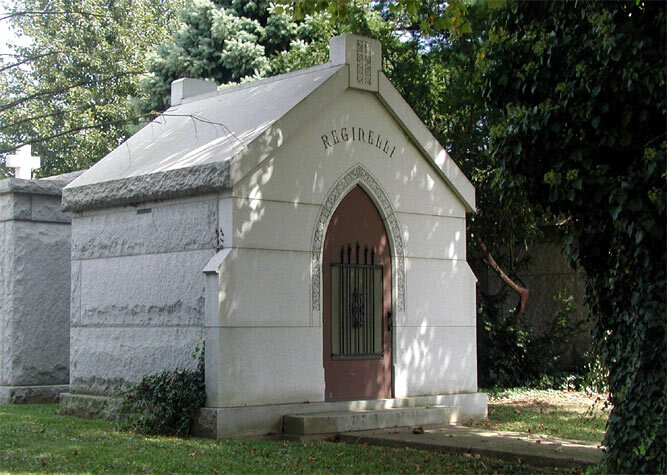 BALTIMORE, May 25 - Marco Reginelli, once described at a congressional committee hearing as "the top hoodlum of the Philadelphia-New Jersey area," died today in Union Memorial Hospital. He was 58. Reginelli's name was brought up in a Senate Investigations Subcommittee hearing on charges of corruption in handling government contracts for making uniforms. Robert F. Kennedy, committee counsel, called Reginelli a "hoodlum" and said he had been arrested 16 times, convicted 6 times and was "involved in three murders". 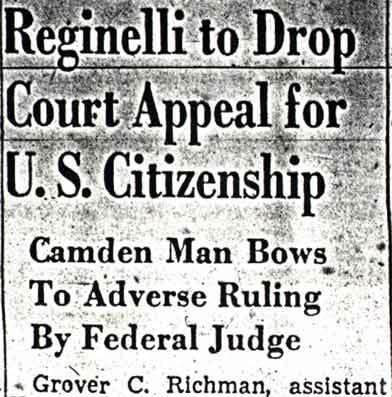 The Italian born Reginelli achieved citizenship but it was revoked after the New Jersey Supreme Court ruled he had "failed to prove good moral character as required." 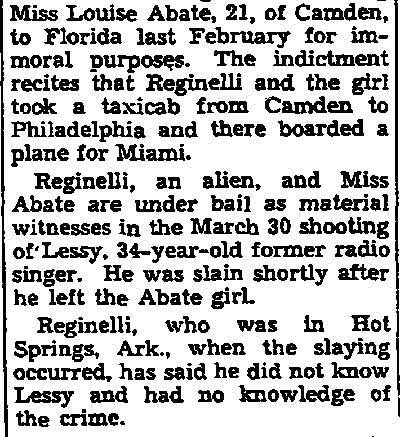 Reginelli was, last arrested in 1942 when he was convicted of transporting a woman from New Jersey to Florida for immoral purposes. 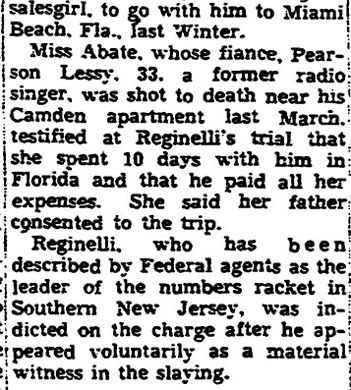 The woman, Miss Louise Abate, was found dead in a Margate, N.J. motel and Reginelli was questioned. It was later ruled she died of natural causes. Reginelli was a Margate resident. Reginelli's previous convictions were for fraudulent conversion, larceny, receiving stolen goods, conspiracy to steal and a violation of the Mann Act. His chief physician, Dr. Howard Chandler Smith, a urologist, would not discuss the nature of Reginelli's illness. My Dad, Frank Yocolano was a musician (sax player) as well as a sheet metal worker until he passed away in 1988. At one point in the 50's he worked at Warren Webster's until he got a job at Edgecomb Steel in 1963. His best friend was a fellow named Woody Sherman (Sciamanna) who was a trombone player. His Dad had a bar on 4th and Royden.